Lot 5 - A.Lange & Söhne Zeitwerk Striking Time. Image courtesy of Watches of Knightsbridge. Some might find the mechanical digital display polarizing but I think the A. Lange & Söhne Zeitwerk Striking Time one of the most beautiful watches that the Saxony watch maker produces. With a design taken from a German Opera House clock, the large numeral digital display is as gorgeous as it is effortless to read. Rather than having a glimpse of the upcoming minute peek out from beneath the German silver time bridge these numerals instantaneous click at the precise time, every time, with German precision. This is the first watch to ever have a jumping numeral display with a decimal minute repeater and that is simple task. Creating a movement capable of storing enough energy to move the digital display was hard enough but to accomplish that and then and one of the most power-draining complications available is nothing short of miraculous. The left hammer strikes the low pitch for each hour, a double low for every ten minutes with the right striking a high pitch for every minute. What is so wonderful about this watch is that you can see the striking mechanism on the dial watch. Unsurprisingly though, this inventive mechanism and display does not a small watch make and the Zeitwerk is 44.2mm and 14.1mm tall. It might seem large but for a design this unique and gorgeous, I think a few millimeters extra is nothing to complain about. Auction Estimate: 25,000 to 35,000 GBP. When I first started covering the Watches of Knightsbridge last year, I said something to the effect of that I would chose watches interested me, regardless of price or rarity. There are countless watches in the auction that have more horological and watchmaking cache than this Chopard but it just interested me. The ultra-thin manual wind dress watch has a diamond set bezel and one of the most stunning bracelets (for it's style) I've seen but it is the dial that is the central focus of this watch. Written in Arabic is the 225th verse of the Surah Al-Baqara, the 2nd Chapter of the Quran. It is the most popular and recognizable passage as it discusses how nothing or nobody is comparable to God. Due to the nature of the text it is impossible to have a true translation, but an English interpretation reads is "Allah! There is no deity save Him, the Alive, the Eternal. Neither slumber nor sleep overtaketh Him.Unto Him belongeth whatsoever is in the heavens and whatsoever is in the earth. Who is he that intercedeth with Him save by His leave? He knoweth that which is in front of them and that which is behind them, while they encompass nothing of His knowledge save what He will. His throne includeth the heavens and the earth, and He is never weary of preserving them. He is the Sublime, the Tremendous." Arabic is a very beautiful language and it's nice to see it written here for such great effect, especially when you consider that by having this written on the dial, Chopard have forgone putting their name on the watch. Given the last auction Watches of Knightsbridge held was in Dubai, I hope to see many an eye on this particular watch. Auction estimate : 3,500 to 4,000 GBP. 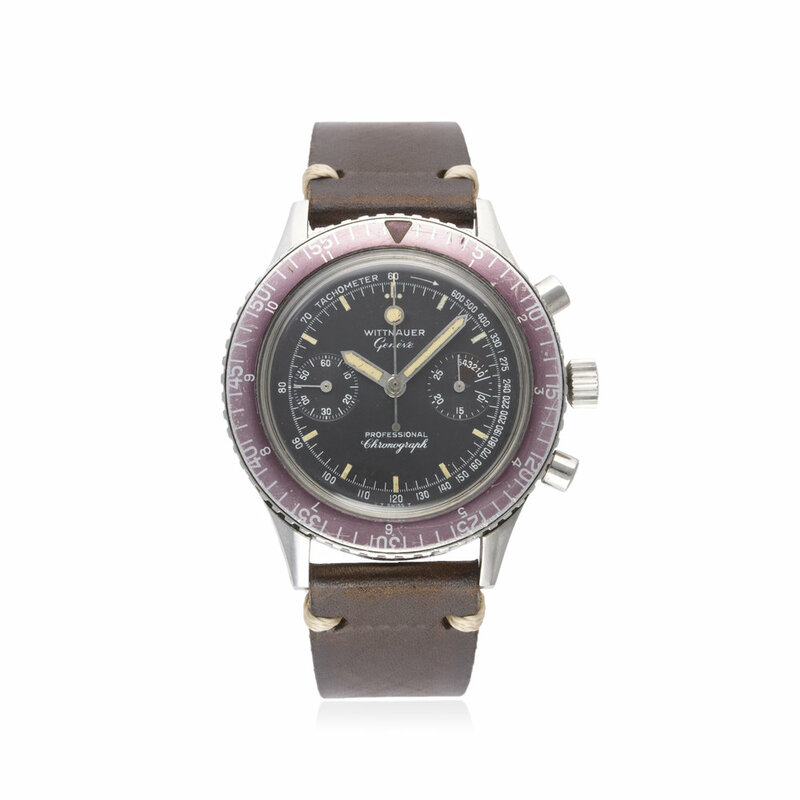 Lot 95 - Wittnauer Chronograph. Image courtesy of Watches of Knightsbridge. If you've been following Timepiece Chronicle for the last nine months or so you'll know that I've developed a definite fondness for Wittnauer. Starting with discovering the companies watch importing roots to their dizzying heights in the sixties and seventies before eventual relegation to cheap quartz baubles sold at Macy's, the Wittnauer story is fascinating. This chronograph from the 1960's speak volumes as to the kind of watch the company was making and the quality of which they made them too. Firstly let's give a round of applause for that lollipop seconds hand. I don't know what it is about them that drives the watch community wild but they do. Perhaps it's just because they seem fun and playful, perhaps because it's a nice alternative to simple stick. Who knows? That lollipop and all the hands and hour markers have developed a stunning patina over the last fifty years that matches the faded burgundy of the bezel perfectly. Writing "Professional" on a dial doesn't make it so but the way this watch is designed shows that it is the small practical and useful touches that truly make a great watch. The dual text on the bezel that allows both minutes and hours to be tracked is a detail that is easily overlooked. Something that I haven't seen before on a chronograph sub-dial is a five minute countdown measure which transitions into a regular sixty minute timer as something as small as that can make all the difference in watch. This watch has stoked my passion for Wittnauer even more which is a shame because the more I write about them, the more people know about them which drives the cost up? That's the price you pay for writing about your passion I guess! 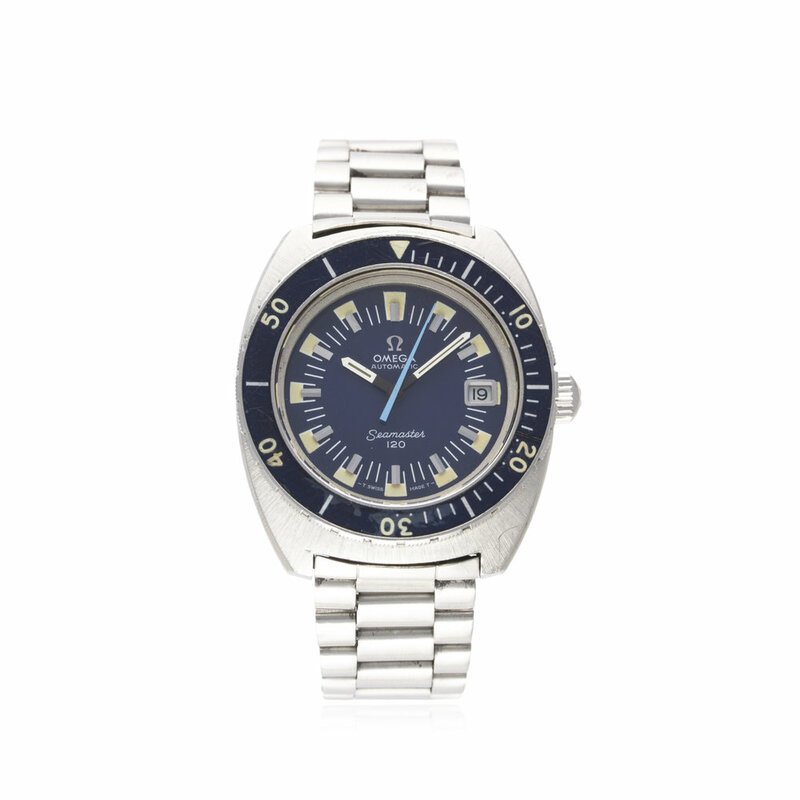 Lot 193 - Omega Seamaster 120. Image courtesy of Watches of Knightsbridge. The beauty about writing about vintage watches is that you can see how each model changes from period to period. Comparing this Seamaster 120 to the one I showcased from ThoseWatchGuys a few weeks back shows just how much variety there is in even within a given model. The case is now more barrel shaped than ever and the lugs are considerably stubbier, the bezel has beefed up with a thicker width and the elegant second hand has been replaced by a glowing Luke Skywalker-esque lightsaber. The thin stick hour markers are not more and now we have the wonderful seventies eclectic style of shapes; squares, rectangles, dashes, raised angles all thrown together and all working (somehow) to make this watch look great. As you might expect from a diving watch, there are signs of wear on this piece with the bezel having a crack at the 19 minute mark with some scuffs and light scratches all around. To me this is part of the charm of a tool watch as each scratch tells you that this was actually used. It might have been snorkelling in the Bahamas or deep sea diving in the North Sea but at least it did something. The dial however looks to be in immaculate condition with no discoloration or cracks that are visible. As with all seventies watches the design might be a turn-off for some but I just love it. 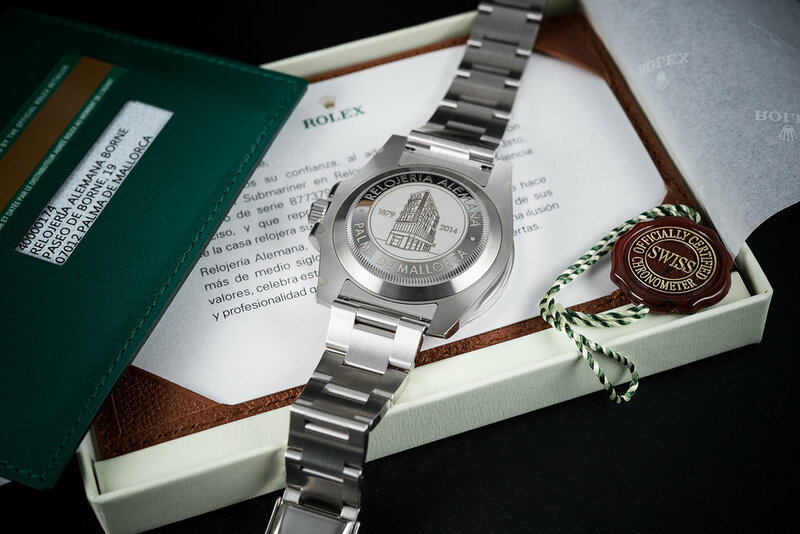 Lot 281 - Rolex Submariner Limited Edition for Relojeria Alemana. Image courtesy of Watches of Knightsbridge. I don't know about you but I never thought I'd write the words "Rolex Submariner" and "Limited Edtion" in the same sentence but here we are. This Submariner was part of a limited run of one hundred and thirty five to celebrate the 135th anniversary of the Relojeria Alemana Boutique, a luxury jeweller in Mallorca. If you compare the current Rolex line-up with say that of Hublot, you couldn't find a collection more different as you'll rarely see a limited edition Rolex compared to...well Hublot's very unlimited amount of limited Editions. I'm sure there are other such Submariners that were released in partnership with jewellers around the world but this is my first so this is the one I'm talking about. From the dial side this looks like a regular production Submariner but if you turn it over you'll see a stunning engraving of the boutique on the steel caseback which is doubly surprising considering the innate blank canvas of a typical Sub case back. I honestly have no idea how this one will fair at auction as all that separates this watch from any other Sub is that caseback. For the novelty alone of a limited edition Sub I reckon there will be at least one person in the room or online willing to bid. We'll see on the 19th what comes of this watch! Auction Estimate: 7,000 to 9,000 GBP. To find out more about any of my highlights or any lot from the upcoming auction please head over to www.watchesofknightsbridge.com.